What could be more tranquil? A patchwork of fields, a landscape trees, some grass and cosy accommodation that allows peace and privacy. The journey is as beautiful as the arrival; on one side guests approach through the waterfall-splashed valleys of the Brecon Beacons National Park (Parc Cenedlaethol Bannau Brycheiniog) and from the other down narrow Hereford Hedged’s twisting lanes, that open every now and again into some of the finest countryside views in south Wales. 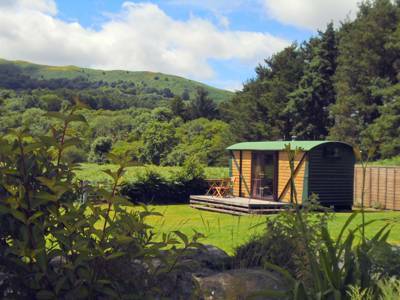 But when you finally pass the quiet farming village of Gladestry and pull into Valley Yurts, you immediately know what awaits will be amongst the most relaxing holidays you're likely to experience. Hidden in a valley buzzing with wildlife – the unmistakable whistle of the Red Kite is a familiar sound – Valley Yurts' traditional Kyrgyzstan abodes (there are 3 onsite) come furnished to a high standard and look fantastic. They are, of course, also perfectly practical. Inside, they boast plenty of creature comforts, including bedding, linen, furniture, rugs and an instantly effective wood-burner, keeping you toasty throughout the night – plus, solar lighting allowing extended evening use. Outside, a well-stocked private dining area has everything you need for cooking-up a storm, and a fire-pit allows you to try that true form of outdoor cooking under the starry Welsh skies. Thankfully, some excellent farm produce is just a short drive away to Kington, an old market town mentioned in the 1086 Doomsday Book. Communal facilities here are immaculately kept, with flushing toilets, hot showers, wash basins, a washing-up area, and the added extra of a kitchen for those times when you prefer not to cook on the fire. Geographically the location is a real winner. Through the gate guests can explore miles of accessible hills, or 1km away join the 8th-century Offa’s Dyke Path – built by a medieval king to intimidate his enemies – passing through many of Wales’ unspoiled landscapes, native wildlife and historic castles. In fact, the path was named by Lonely Planet as one of the world's top-10 wall walks, alongside the Great Wall of China! Alternatively, head in the other direction towards the hilly literary town of Hay-on-Wye, where you can hire a canoe and paddle down the weaving River Wye, or pop across to the Brecon Beacons National Park and walk behind crashing waterfalls. Adrenaline junkies will find pleasure here too, with gorge walking, climbing, mountain biking and pony trekking all on offer. 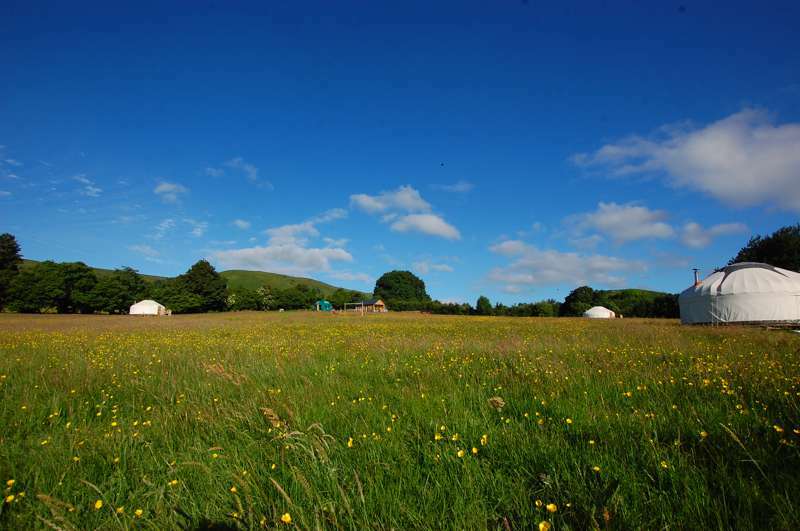 In short, there’s plenty to do around Valley Yurts, but with such a picturesque hillside setting there's a good chance you won't leave the site itself. Many visitors plan to stay for the weekend but end up having a weeks holiday. Which says it all, really. This will be our second season in the valley and we hope you experience the same goosebump moment as you drive into the field and see what we saw when we decided to move here from Brighton. 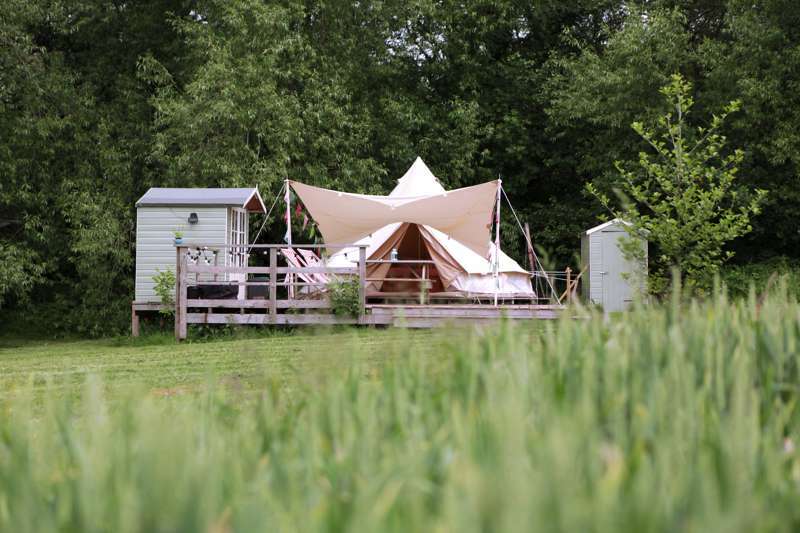 Our choice to create a glamping site with yurts is borne out of a love of the outdoors and camping with our two boys as they were growing up. We hope to contribute to your happy memories of relaxing holidays and exploration. Our traditional Kyrgz yurts are a spacious 18’ diameter with a crown in the centre to stargaze at night. The Kyrgyz yurt differs from Mongolian designs in the way the woodwork is steam bent to produce a curved, rounded roof shape that offers more headroom and creates a spacious living area. Whether you are seeking a peaceful get away or would like to explore new adventures, both are possible here, you can do as little or as much as you choose. 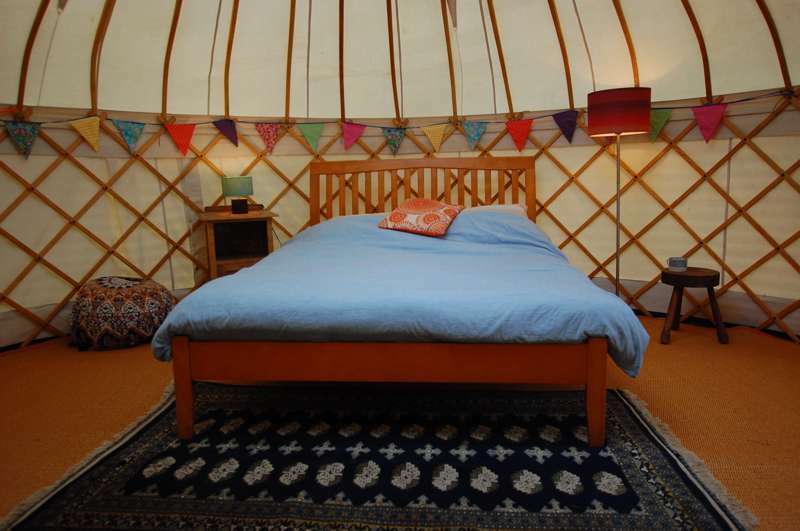 For latest availability and best prices for Valley Yurts, please use the Date Search above. Simply idyllic. 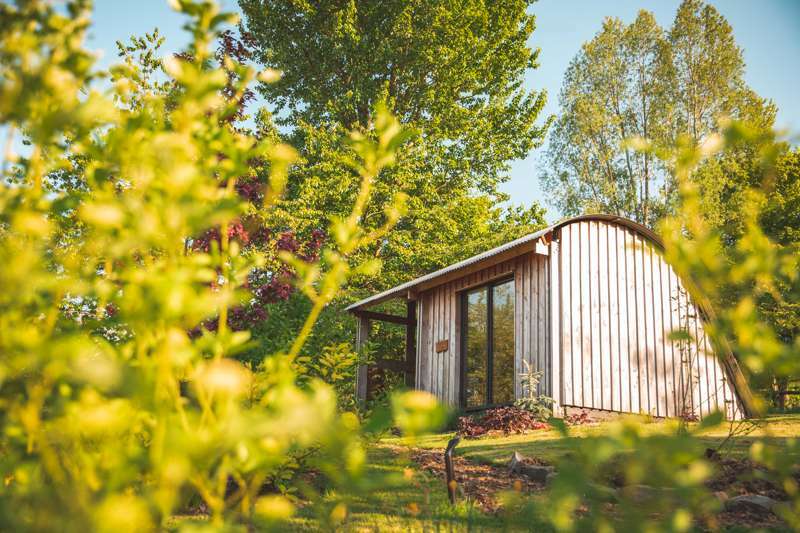 If you would love to awaken to birdsong and amazing views with easy access to local gems such as Hay-on-Wye and Ludlow then you could pick no where better than Valley Yurts. All presented to the highest possible standards with amazing attention to detail. Came away feeling totally relaxed and chilled out. Can't wait for our next visit ! Simply idyllic. 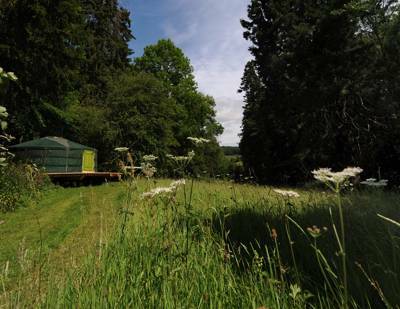 If you would love to awaken to birdsong and amazing views with easy access to local gems such as Hay-on-Wye and Ludlow. All presented to the highest possible standards with amazing attention to detail. Came away feeling totally relaxed and chilled out. Can't wait for our next visit ! We booked all 4 yurts for a girly weekend and had an incredible time. The set up is perfect and the facilities are great. Lovely showers, equipped kitchen area and comfy beds. The outdoor fire for cooking was a great experience and easier than expected. The location is idyllic, a beautiful view and really peaceful. Hammock was a lovely touch! Hopefully we can come back some time. What an incredible spot a real escape from it all with all the essentials and then some to guarantee the perfect getaway! Jo and Matt were incredible hosts and we enjoyed an amazing time 'getting back to nature' but in a perfectly cosseted way! My highlight was sitting around the firepit, surrounded by friends and woodland, wrapped in a blanket, gazing at the most incredible starry sky, how often do you get chance to appreciate something that magical? This site is a real treat of a place for the soul as much as the body, we will be back. Thank you. Tucked away a mile or so outside of the village of Gladestry we had a special weekend at Valley Yurts; a peaceful and secluded site close to the Welsh border, with the mountains as a backdrop. 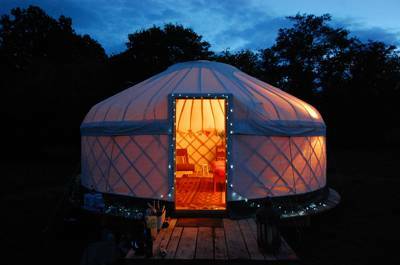 Our yurt was beautifully decorated, spacious, yet cosy with a wood burner for the evenings. Outside we had plenty of space to ourselves with wooden tables and benches next to a fire where we cooked dinner and sat around chatting until far too late! The Offa's Dyke path is nearby and we enjoyed a lovely walk with spectacular views along to Kington. Matt and Jo have been really thoughtful in the creation of this idyllic site, one that we will certainly be returning to. This is the place for a really warm welcome in some of the most beautiful countryside in the United Kingdom. An amazing site on the border between England and Wales with stunning views in every direction. 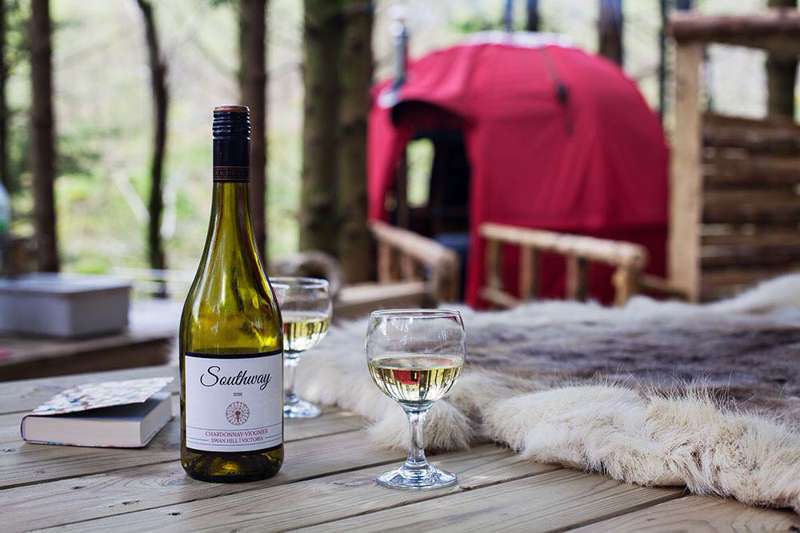 Based round a charming 300-year old farmhouse, Valley Yurts offers peaceful seclusion, but with access to charming villages and small towns not too far away. As a novelist I especially appreciated being able to have a lovely countryside base for the Hay-on-Wye book festival, ten miles away. 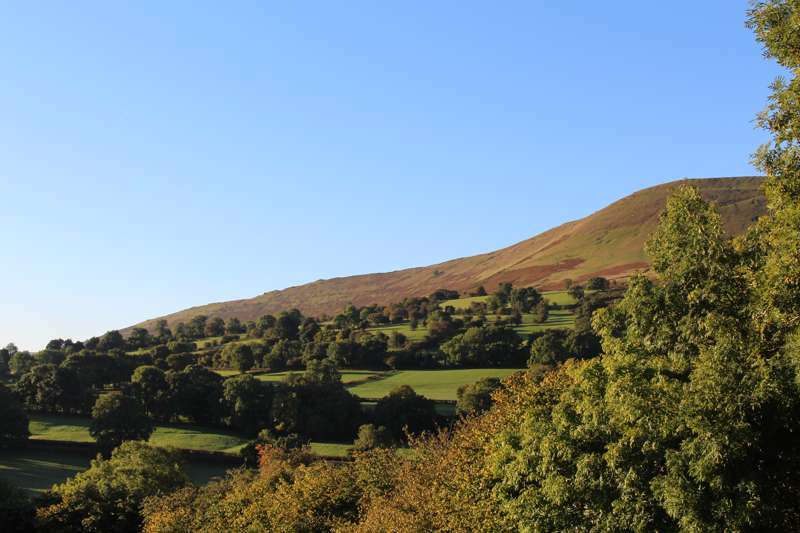 There is walking of every type from casual strolling to serious mountain trekking, with every level in between, with access to the Brecon Beacons, and the mid-Wales section of Offa’s Dyke Path. Owners, Jo and Matt ,could not be more helpful. Very highly recommended. 3 yurts, each sleeping 4 to 6. 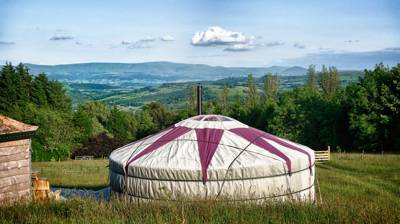 Max 4 adults per yurt. We can accommodate larger families with 2 adults and 3/4 children, please contact us to arrange this. 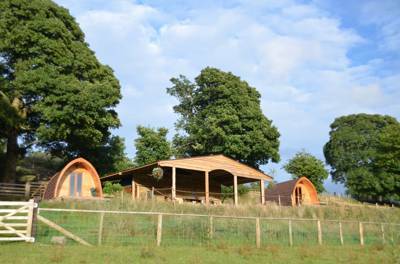 Glamping only – sorry, no tents or caravans. Dogs are welcome but must be well-behaved as sheep and chicken onsite. Groups are very welcome but sorry no Hen or Stag do's. Each 18' diameter yurt sleeps four, with one double bed and two singles, bedding and linen included, but please bring your own towels. 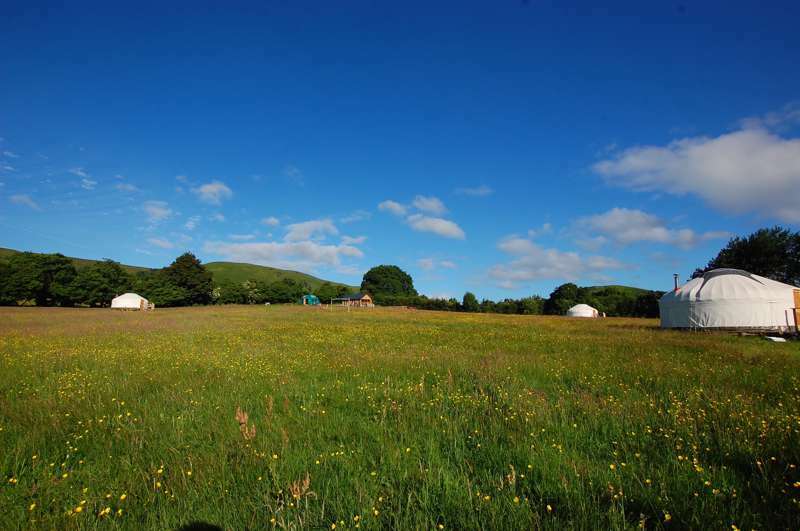 Valley Yurts can also provide two extra beds for larger families. 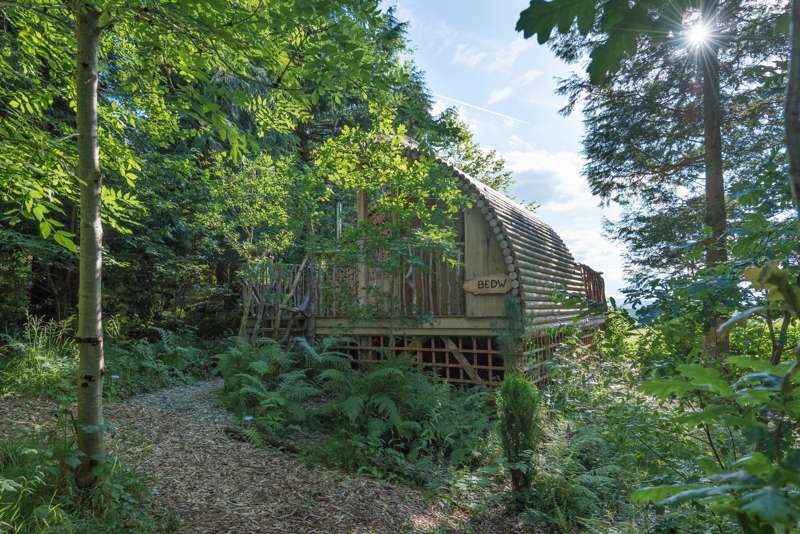 Inside, the yurts also feature a wood-burner and solar lighting for extended evening use. Each accommodation has its own outdoor cooking area with fire pit, tripod, enamel hanging Hungarian Kotlich stew bowl, BBQ plate and frying dish. Everything you need for cooking on an open fire, from a hearty one pot, a quick and easy BBQ to a morning fry-up. 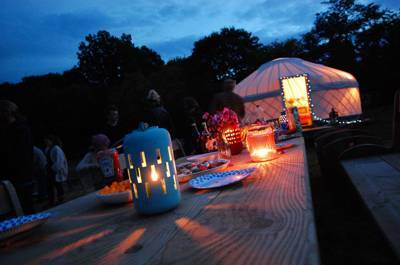 Valley Yurts also offer recipes and can provide ingredients for your first evening meal on request. The site features a fully-equipped communal kitchen with running water, cooker, hob, tables, fridge, pots and pans, crockery etc – tea and coffee is also provided. The toilet block has flushing loos, hot showers, hot water wash basins and a washing-up area, there are also phone-charging points. We also offer home made pizzas prepared and cooked for you in our wood fired pizza oven. (£7 each) . Please enquire in advance to book for your chosen date. Where to start? 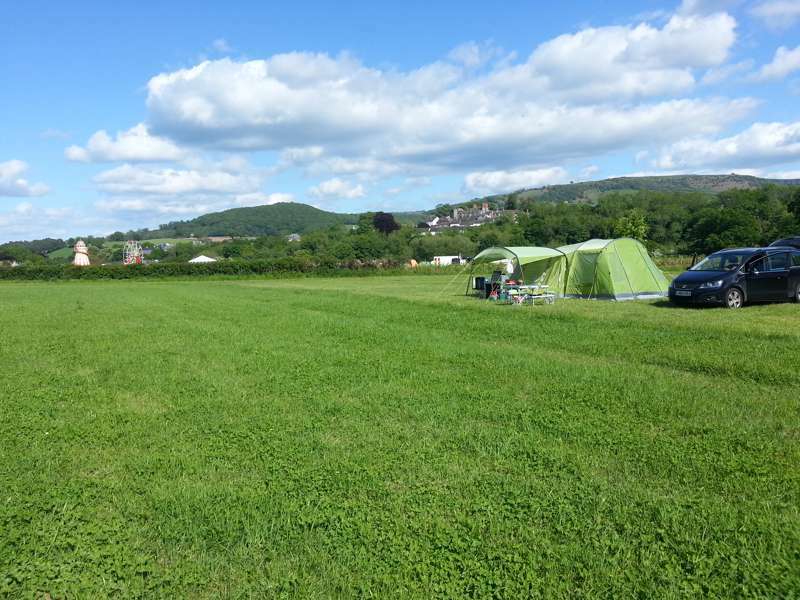 Valley Yurts is found at the foot of Offa’s Dyke Path, which is a comfortable 1.5 hour walk into the nearest town of Kington. Although a steady slope up to Hergest Ridge, the walk across the ridge is grassy and flat with beautiful 360-degree views. Whether you prefer a 2-hour or 2-day walk, Offa’s Dyke is ideal – and named by Lonely Planet as being among the world’s greatest walks. The famous literary town of Hay-on-Wye is only a short drive, with plenty of antique shops, cafe's pubs and restaurants. The Hay Festival of Literature and the Arts is a must and takes place at the end of May. 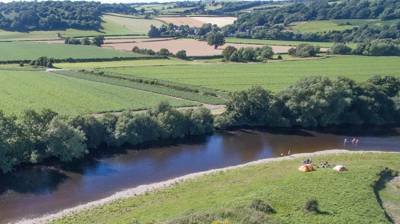 There are several canoe and kayak companies in Hay where you can hire boats or canoes to navigate The River Wye's easy routes which are suitable for all the family. Discover the Black and White Village Trail, characterised by the large number of timbered and half-timbered houses in the area, some dating from medieval times. Pembridge, the nearest medieval town is only 12-miles away and a short drive out of the village past the market square will bring you to Dunkertons Cider Mill where organic cider and perry is made using traditional methods, with cider apples and perry pears from local orchards. In under an hour you can be in The Brecon Beacon National Park, and choose from lots of outdoor activities including; cycling and mountain biking, gorge walking, horse riding and trekking and watersports. Pack a bag, some snacks and head off to the Four Waterfalls Walk, one of which you can even walk behind – well worth a visit. Kington offers a range of cafes, pubs and take-aways, plus there are shops selling local meat and farm produce, with two supermarkets also in the town. The Harp Inn (01544 350655) in Old Radnor is famous for its excellent food using only local suppliers. The Roast Ox (01497 851398) in Painscastle offers excellent home-cooked pub meals in a very traditional and friendly pub. Hay-on-Wye has a large offering of cafes, restaurants and bars to suit all tastes, including: tapas, falafels, bistros or a hearty Sunday lunch in The Blue Boar (01497 820884). There' s no shortage of pubs in the area too offering food, and local ales and cider. 30 March – 20 October. Approaching from Kington: as you enter Gladestry, go past the primary school and just after the Royal Oak pub, turn right before the church at the triangle of grass. Then turn immediately left, keeping the church on your left. Continue down a narrow lane (1.1 miles), when the road forks always take the right – often the Sat Nav will stop at Wood Farm, however keep going – and Lane House Farm and Valley Yurts is the next house on the right of the road. There's a car park on the right immediately after the house. The nearest train station is Leominster (20 miles) with direct trains from Manchester, Birmingham, Cardiff. Hereford Station (27 miles) serves London and the south coast. There's a bus service from Hereford to Kington, the nearest town. If you're travelling by public transport taxis are available, or the owners can also collect you from Kington by arrangement.